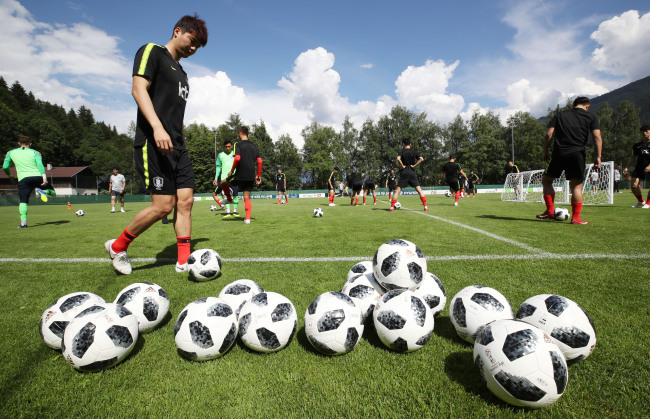 LEOGANG, Austria -- South Korea's national football team for the 2018 FIFA World Cup kicked off its training in Austria on Monday. The men's national team arrived in its pre-World Cup training camp in Leogang, Austria, on Sunday after traveling more than 15 hours from Incheon International Airport. The 23 players didn't train in the morning as they took rest to overcome jetlag. Some of them were seen taking massages from their medical staff to relieve tight muscles from the long trip. The team ate Korean food for lunch that was cooked by two nation team chefs who also prepared dishes for the players during their stay at the National Football Center in Paju, north of Seoul, in South Korea. In South Korea's first training at Steinbergstadion, the players started with light jogging and had a game-like exercise which was to put the ball into mini target goals. The players then formed a team of five and played football volleyball. The training programs were reportedly prepared by the national team's fitness coach, Javier Minano. South Korea will undergo intensive training the next two days to prepare for their friendly against Bolivia, which will be played at Tivoli-Neu in Innsbruck, Austria, on Thursday. South Korean head coach Shin Tae-yong said he would test the best 11 in the match against Bolivia, though their key tactics and set pieces would not be revealed. Jang Hyun-soo, a center back who missed South Korea's two recent friendlies at home, is likely to play against Bolivia after recovering from an ankle injury. After facing Bolivia, South Korea will take on Senegal on Monday behind closed doors. The Taeguk Warriors will then fly to their World Cup base camp in Saint Petersburg, Russia.